You can download the instrument listing which details the number of variations for each sound, keyboard mapping, and memory requirements. Most instruments come in keyboard split and velocity maps, as well as regular and ECO (economical) setups, if memory is at a premium or if you prefer to keep things a bit more simple. 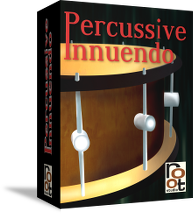 The gold edition of Percussive Innuendo contains all instruments in wet (light compression and ambience) and dry versions. The standard edition contains the wet version only. Ever wished you had a single hit to put at the end of a looped phrase so the loop can end naturally on a ringing or sustaining note? For all relevant loops, we have included just that. The loops come treated in the standard and gold editions, while the gold edition contains the unprocessed loops as well. Remember that these sounds blend perfectly well with the single hits from the list above. 068-Comper - Basic accompaniment on finger cymbals. Works for a wide range of tempos. Straight and shuffled versions. 072-Lazed back - A thick ratchet that slightly lags behind the beat. 076-Shake it slow - Rainmaker goes shaker. 2/3 variations dry/wet plus end hit. 080-Fill that bar - Finger cymbals playing a fill at the end of a bar. 2 variations. 084-No comfort - A foreboding atmosphere on concert bass drum. Sinister rumbles at lower speeds, powerful pacemaker at faster speeds. 4 variations. 084-Tiny feet - Background or intro phrases on temple blocks. 7 variations. 092-Tin drum - Basic rhythm on prepared Chinese wind gong, reminiscent of an oil drum. 4/8 variations dry/wet. 092-Triangle doubled - Basic accompaniment on double triangle. 2/3 variations dry/wet. 094-Cold outside - Basic rhythm on sleigh bells. 2/3 variations dry/wet. 096-Loose sticks - Bongo rhythm with tremolos and varying accents. Great for remixing or reshuffling the original grooves. 4 variations. 100-Basic ratchet - Simple rhythms on ratchet 2 with a clockwork feel. 2 variations. 100-Shake it fast - Rainmaker goes shaker. 2/3 variations dry/wet plus end hit. 108-Stomper - Marching, stomping rhythm on prepared Chinese wind gong. 3/6 variations dry/wet. 110-Pusher - Syncopated beat on desert thunder. 5/6 variations dry/wet plus end hit. 112-Indian summer - Beautiful groove on desert thunder with bends that are reminiscent of tablas. 3/6 variations dry/wet plus end hit. 116-Marching toys - A stark beat on ocean drum, suitable for cartoon work. 3 variations. 124-Ooga ooga - Bamboo chimes loop suite to give any track a completely different feeling. 3 variations. 132-Sizzle - Medium fast backing cymbal type beats played with rods on tam-tam in 16ths, 8ths, and triplets. 19 variations plus 2 end hits. 140-Small Ben - Accompaniment patterns on double triangles. 1/4 variations dry/wet. 144-Sizzle - Fast backing cymbal type beats played with rods on tam-tam in 16ths. 7 variations. 160-Feel the urge - An energetic beat on desert thunder. Great for layer work. 4 variations plus end hit.